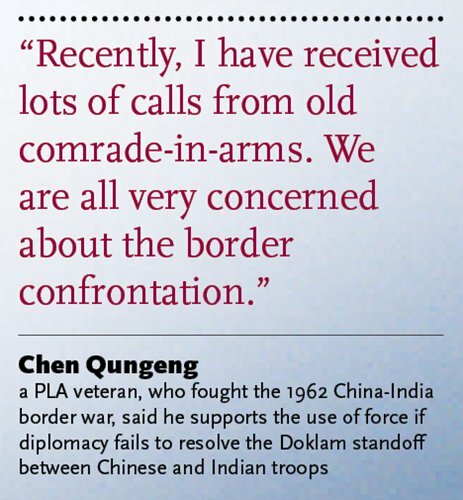 India's trespass into Chinese territory has angered many veterans in China who fought the war on the Sino-Indian border 55 years ago. They have vowed to send their children to the battle field if another war is needed. "India's intrusion and denial to withdraw has set off a wave of anger among us. When we heard that the army unit where we used to serve has been recently dispatched to Tibet, we felt excited," Chen Qungeng, director of the 1962 border war veterans association in Shaanxi Province, told the Global Times. "If needed, we are willing to send our sons and grandsons to the frontline," pledged the 73-year-old man in Xi'an, who was an anti-aircraft gun soldier during the war. In mid-June, Indian troops crossed the Sikkim section of the China-India border and attempted to interrupt a road construction in the Doklam area in Yadong county of Southwest China's Tibet Autonomous Region. Despite repeated protests by Beijing, New Delhi enhanced troop deployment and continued a face-off with Chinese troops. "Recently, I have received lots of calls from old comrade-in-arms. We are all very concerned about the border confrontation," Chen said. "We are soldiers. If diplomacy can't settle, we support use of force." "We destroyed their elite troop decades ago, so can we now," said Han Xuerun, 77, who served as a clerk in a chemical defense company during the war and authored War on the Roof of the World, a documentary novel about the war, in 1995. According to Chen, the veterans are planning activities to mark the 55th anniversary of the war. Previously, they always kept low-profile. This year, they want to be different. The China-India territorial disputes started in 1914, when British India and a bunch of Tibetan representatives unilaterally signed the illegal Simla Accord and created the McMahon Line, a line the Chinese government has never accepted. When India won independence in 1947 and established diplomatic relations with China in 1950, it continued to assert the McMahon Line as the border. On October 20, 1962, China launched a counterattack on the Sino-Indian border after India increased military provocations in the region and attempted to gain territory by force, according to Neville Maxwell, an Australian journalist who covered the 1962 China-India border war. At first the then Indian Prime Minister Jawaharlal Nehru was convinced that his army with the backing of the US and the Soviets would be invincible against the Chinese troops. However, the People's Liberation Army (PLA) broke India's offense and destroyed its forces within a month. 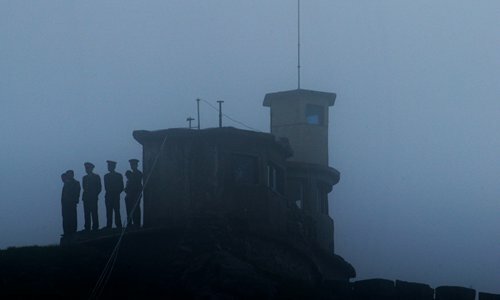 "We crossed the McMahon Line and advanced deep into the plains like Tawang town near the actual control lines. 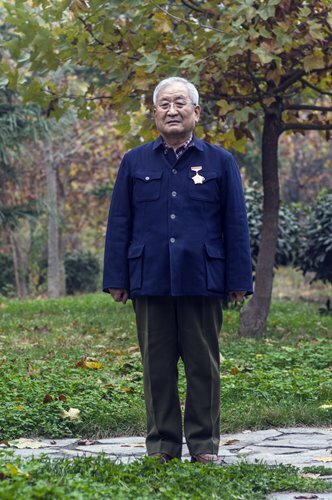 The enemies fled in all directions," Ye Hongliang, 76, a PLA medic in the war, recalled in an interview with the Global Times. However, in a shocking move, Beijing suddenly called a unilateral cease-fire on November 21, 1962 and ordered its troops to retreat to their previous positions 20 kilometers behind the line of actual control. According to the statistics provided by Chen, which he said he had obtained from an internal book on the war published by Military Science Publishing House, 4,885 Indian soldiers were killed and 3,968 were captured in the war. On the Chinese side, the death toll was 722 and none were captured. But there are few official reports about the triumph either in writing or videos, largely out of concerns that it might affect the bilateral ties that began to improve after 1976, according to Fang Zhenjun, a researcher from the China Institute of Cyberspace Strategy. "For years, the war was scarcely mentioned in the Chinese government statements, official news reports or textbooks; neither has the government held any public commemorative activities," Fang wrote in a commentary. The veterans say they are disappointed that many young people know nothing about the war. "Once when I talked about my identity as the 1962 war veteran to some young civil servants, they were surprised, saying they never knew there was a war between India and China, except that a monk went to India to get Buddhist scriptures," Chen said. "But now that the Indian side has raked up the war, it should serve as a wake-up call for breaking the silence and commemorating the war openly," Fang noted. On June 30, India's Defense Minister Arun Jaitley said that India is not what it was in 1962. Fang suggests China officially commemorate the war. "Memory will not sow seeds of hatred, but will trigger reflection on how to build long-term neighborly relations," he wrote. Han, a consultant to the veterans association, told the Global Times that he has just finished the script for 40 episodes of a TV series about that war. "Overcoming bitter cold, low oxygen level and poor armaments, we triumphed over the Indian troops. The patriotism, heroism and spirit of sacrifice deserved to be passed on," Han noted. 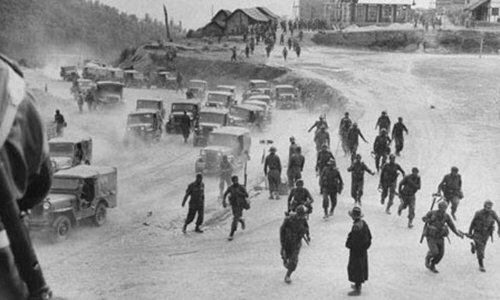 Chen said his unit, the 55th Division which was a major force in suppressing the 1959 Tibet revolt, received an emergency call on a day in October 1962 when they were harvesting highland barley near the Qinghai Lake. They immediately rushed back to their camp on the outskirts of Xining and set for the frontline in Tibet that very night after stocking sufficient food and arms. To prevent frostbite and get warm, they got off the trucks every two hours and ran for about 20 minutes. 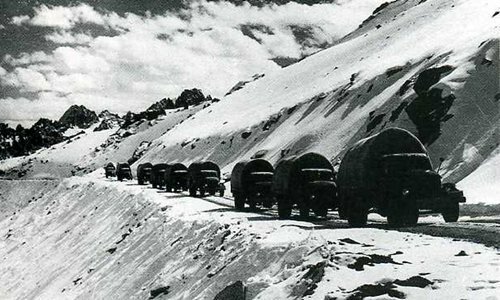 Nearly all adults in Tibet were mobilized to build roads. Still, due to poor vehicle and road conditions, they spent nearly half month to reach the border area, he recalled. On many occasions, they had to walk and carry cannons on their shoulders to cross the ice-capped mountains at high altitude. "While encircling the Indian troops, two soldiers in my company died in one day from emphysema due to oxygen deficit," Ye recalled. He felt the Indian troops' arms were superior to theirs. "Most weapons we used were from the Korean War and even War of Liberation. But India had weapons provided by Britain and Soviets," Ye said. "For instance, we used non-automatic rifles, while their rifles were semi-automatic or automatic; our cannons were carried on shoulders, theirs were on jeeps; their officers had sleeping bags, soldiers had woolen blankets while we only had wadded cushions; they ate canned meat and vegetables, while we ate fried wheat flour," he cited. Nevertheless, India suffered a crushing defeat. "We were young. Many Indian soldiers were middle-aged. We had firm faith in safeguarding the country and would hold the field till the last one. They were mercenary and were free to flee the field," Ye said. Obeying the central order, they treated Indian prisoners well. "We tried to attend to their needs first, such as food and even cigarettes, even when we were short of materials. Special condolences were also held for them," Han recalled. The prisoners were all released to India, together with all the captured weapons and vehicles after being cleaned up, mended and fueled by Chinese soldiers, according to the veterans. However, the Indian politicians didn't recognize the Chinese goodwill and still take the cease-fire as a "humiliation." In early June, India's Army Chief General Bipin Rawat said that India was ready for a two-and-a-half front war (against Pakistan, China and domestic extremists). The veterans believe that China is fearless to fight another border war in self-defense, since China's transportation in Tibet and military strengths have both greatly improved. But many Chinese regret China's initiative to retreat and reckon that China failed to benefit from the victory in the 1962 war. "After the retreat of the Chinese army, the Indian troops advanced. They not only took the disputed areas in the south of the McMahon Line under their control, but also encroached upon the areas up north," Jin Hui, an army writer, lamented in his book The Charm of Tibet's Medog published in 1995. In February 1987, Indian authorities declared the founding of the so-called Arunachal Pradesh and declared some 60,000 square kilometers of Chinese territory in southern Tibet under their control. Han said many soldiers at that time were not resigned to retreat. "The officers had to do ideological work from stage to stage. In the end, we withdrew. We listened to Chairman Mao: we had achieved what we wanted and forced them back to the negotiation table," he explained. Both Chen and Ye also explained that the insufficient food and materials could hardly support a long-lasting battle. However, Maxwell, who has been going against the Indian collective memory that the month-long border war as an unprovoked act of aggression by China, believed that Beijing's retreat has won trust among Western countries by proving its claims of "peaceful rise." The then US National Security Advisor Henry Kissinger and then US president Richard Nixon both read his book India's China War, which chronicled how India provoked Beijing into the fight and challenged the entrenched "aggressive China" notion, before visiting and building relations with China, Maxwell revealed to South China Morning Post in an interview in 2014. Since 2012, Ye and several other veterans have started to collect various documents and memoirs to compile a book about the war. In April, the book titled Fight at Snowy Summit was finished. He hopes the book will be published. "I wish the young people do not forget the history and carry on the staunch perseverance and unyielding will to fight," he noted. Maxwell believed that the 1962 war has left lessons for the world. "China is conflict-averse and will do all it can to reach peaceful solutions, but it can't be pushed around and will never back away from defending what it sees as its basic security concerns. If the issue becomes fight or surrender, the PRC will always fight," he told the Post.